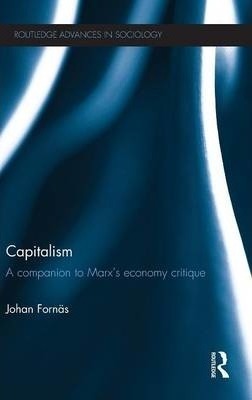 In the most complete, accurate and accessible presentation of Karl Marx's theory of capitalism to date, Johan Fornas presents a guide for anyone who wants to understand how today's crisis-ridden society has emerged and is able to sustain and intensify its own deep inner contradictions. Capitalism clearly explains these contradictions, which are so relevant again today in the wake of the financial crisis. This clear and engaging guide explains capitalism for absolute beginners. Fornas situates Marx's ideas in context, remaining faithful to the concepts and structure of his work. This complete introduction to Marx's economy critique covers all three volumes of Capital. It explores all the main aspects of Marx's work - including his economic theory, his philosophical sophistication and his political critique - introducing the reader to Marx's typical blend of sharp arguments, ruthless social reportage and utopian visions. This book will be of interest to students throughout the social sciences and humanities, including those studying sociology, social theory, economics, business studies, history, cultural studies, and politics. Johan Fornas is Professor of Media and Communication Studies at Soedertoern University in Stockholm and Editor of Culture Unbound: Journal of Current Cultural Research. His books include Cultural Theory and Late Modernity (1995), In Garageland (1995), Digital Borderlands (2002), Consuming Media (2007) and Signifying Europe (2011).